ST. LOUIS – In a paper published in Profession, the Modern Language Association's journal about modern languages and literatures, a Saint Louis University professor discusses how he uses video games to teach Italian, allowing his students to master two semesters worth of language acquisition through one intensive class for students new to the Italian language. "Games have now evolved," Bregni said. "They are interactive movies." Though Bregni has used Final Fantasy, Trivial Pursuit, Who Wants to be a Millionaire, Heavy Rain and Rise of the Tomb Raider in his classrooms, one of the most useful games to teach Italian is Assassin's Creed II. "In my Italian Renaissance literature course, for example, students explore Florence as it flourished under the Medici by playing Assassin's Creed II," Bregni says in the paper. "My 21st-century American students partake in the life of Ezio Auditore, a 20-something man from an affluent family, by wandering around a cultural and historical re-creation of 1476 Florence." Recently, Bregni received a fellowship grant from SLU's Reinert Center for Transformative Teaching and Learning to use a state-of-the-art learning studio to develop a language course based entirely on gaming. "Studies indicate that a strong shared interest within a learning group will foster language acquisition," Bregni said. "We start with things that students know and can figure out, which is reassuring, and we build from there." "I firmly believe that learning should be fun," Bregni said. "The fact that it is fun doesn't take away from the seriousness — it's just more effective." 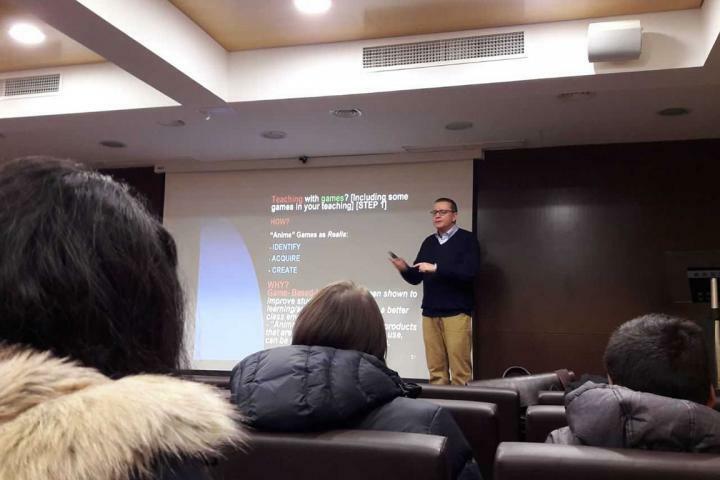 This semester, Bregni is conducting workshops about gaming and language acquisition at universities in several cities across Europe, including Saint Louis University's Madrid campus. In 2017 Bregni was awarded the the James H. Korn Scholarship of Teaching and Learning Award by the Reinert Center at Saint Louis University.